Does every compound have a unique boiling point? No, and this is one limitation of distillation as a separation technique. If two chemicals coincidentally have very similar boiling points, then it will be difficult to separate them using distillation. A simple distillation device (or “still”) takes advantage of the fact that compounds usually have different boiling points and can be separated by applying heat to a solution. 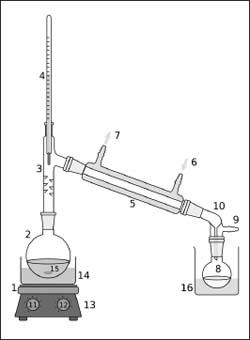 In this diagram, the parts include: 1) a heat source, 2) still pot, 3) still head, 4) thermometer/ boiling point temperature, 5) condenser, 6) cooling water in, 7) cooling water out, 8) distillate/receiving flask, 9) vacuum/gas inlet, 10) still receiver, 11) heat control, 12) stirrer speed control, 13) stirrer/heat plate, 14) heating (oil/sand) bath, 15) stirrer bar/anti-bumping granules, and 16) cooling bath.